Gran Hostal is totally brand new!! It is focused on international and flashpacker traveler, at the hostel you will find private and double rooms, but dorms for all your friends too. All of them have WiFi internet connection, personal night lamp and plug in for charge your gadgets. 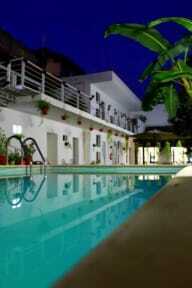 Grand Hostal has a huge common area with pool, sun-lounge with hammocks and sun-tanned beds. But also space to play soccer, volley ball or water polo. We are located on the 20th Avenue between 4th & 6th Streets. We are only 4 streets or 5 mins walking straight to bus Station ADO, Wal-mart and the best clubs in Playa del Carmen!! True to the ad on hostel world.. Perfect if you need a quick stopover in Playa. Not really a ‘backpacker’ place but it has everything you need. Quiet hostel close to 5th Ave, very clean, friendly staff. Nice and clean. Good location - only two blocks away from the main street. Staf very friendly. Only one thing: the family living and working there share the same kitchen and bathroom, and hang out in the common areas. They are all very nice and friendly but it kind of made me feel like I was intruding. Maybe it was just bad luck or timing, but this hostel was full of older folks when we were there, so I can't comment on the atmosphere. The location is great, and so is the "backyard." Breakfast was simple but good. Kitchen and water pressure leave a little to be desired. The staff were all friendly, but the one lady we dealt with the most didn't seem to have many recommendations. The staff were friendly enough and the beds were pretty comfortable. There’s very little room to put any bags or belongings but it’s cheap and it’s a bed. Good location. Location is good, facility is good but the beds are awful and the rooms felt really cramped. Yes there were lockers in the room but it takes so much room that you don't know where to leave your backpack. AC was blowing so stong at night that it was too cold to have a good sleep. Bring a bkanket. There were also people who work in Playa sleeping in room so not a traveler feel in the hostel. I was only there for a night but I would not stay there again.